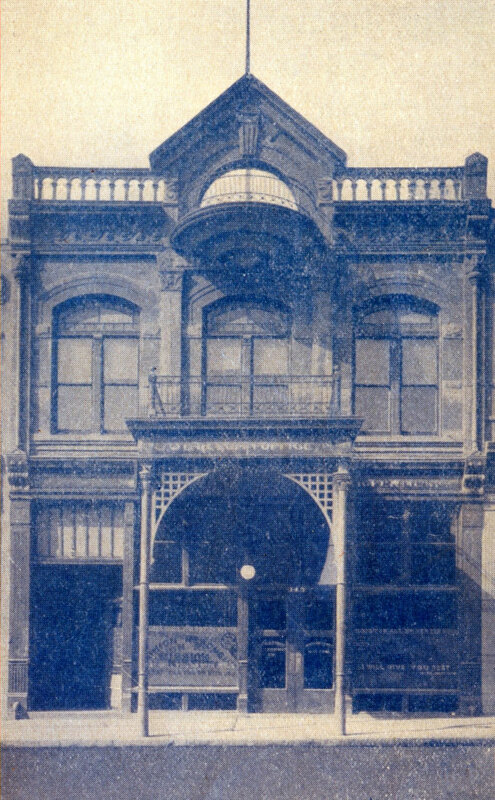 The Union Rescue Mission is well-remembered for its historic home at 226 South Main, where it held forth for fifty-plus years. That site, a labyrinthian place made up of two large linked structures, was famously felled for parking in the mid-1990s, though continues on in the memories of many. Before 226, the Mission spent a near quarter-century in another structure: it is long forgotten, as is the streetscape around it, all obliterated in the name of Civic progress. Truth be told, the Mission had a collection of “first homes.” There was an office at 431-433 South Spring, larger rooms in a converted saloon near Second and Main, and through the 1890s, a nomadic tent life under canvas roofs on lots located at Second and Spring, First and Los Angeles, and/or First and Spring. The Depression of ’93 and the Panic of ’01 certainly helped send men into the tents. 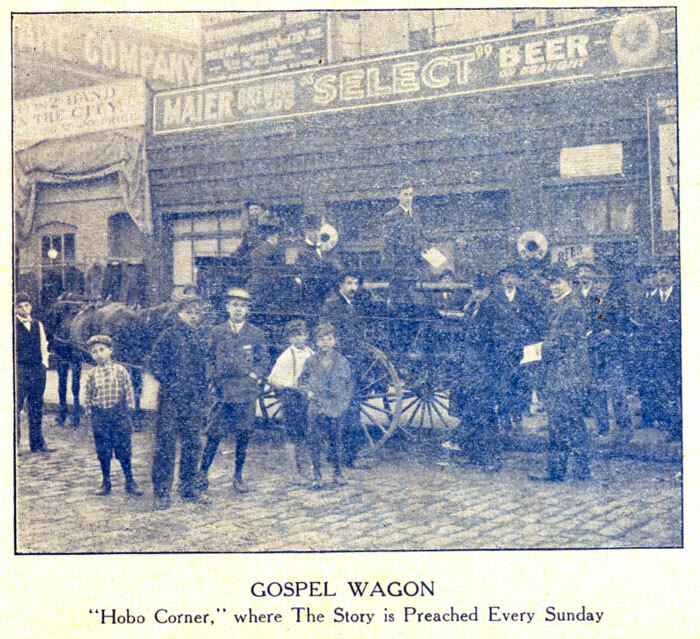 In March of 1903, the Pacific Gospel Mission set down roots in a narrow, two-story structure at 145 North Main. 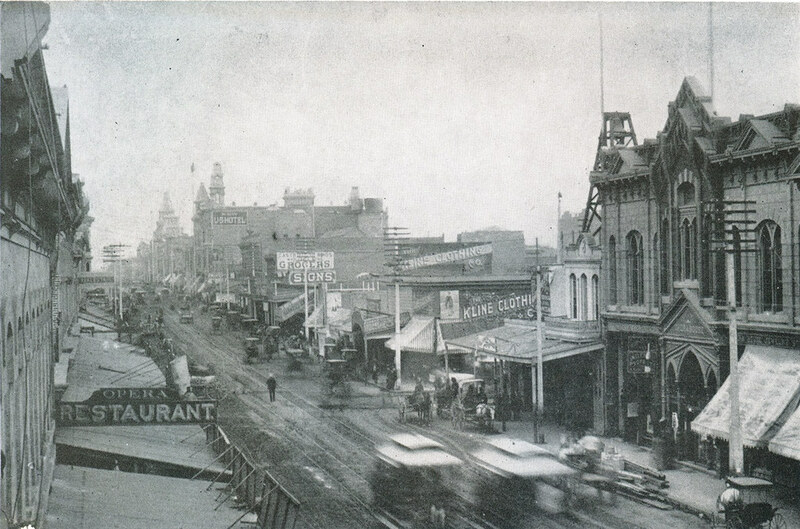 (This is a view of Main in 1891, from out the window of the Natick, looking north across First, our Mission at 145 would be up the block, flush against the left side of image.) After they move into 145, the Pacific Gospel Union AKA Pacific Rescue Mission becomes, under the able hand of Union Oil (besides Lyman Stewart’s tutelage, many early Mission movers and shakers were UO bigwigs, e.g. 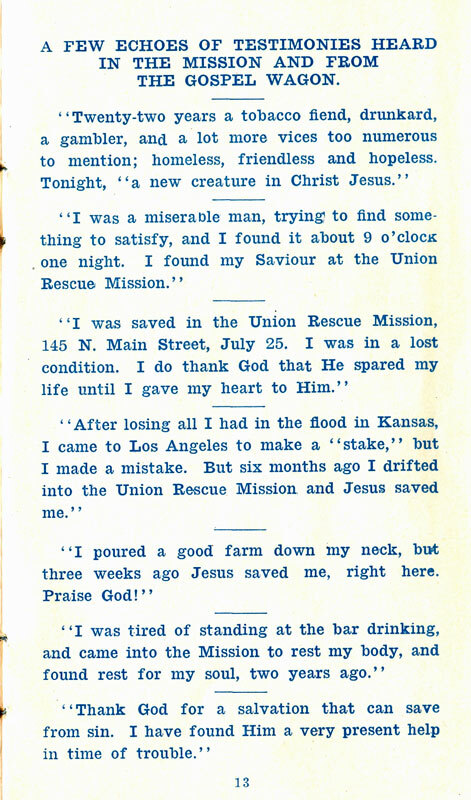 Giles Kellogg and Robert Watchorn, or Union friendlies like Herbert G. Wylie, et al), the Union Rescue Mission. 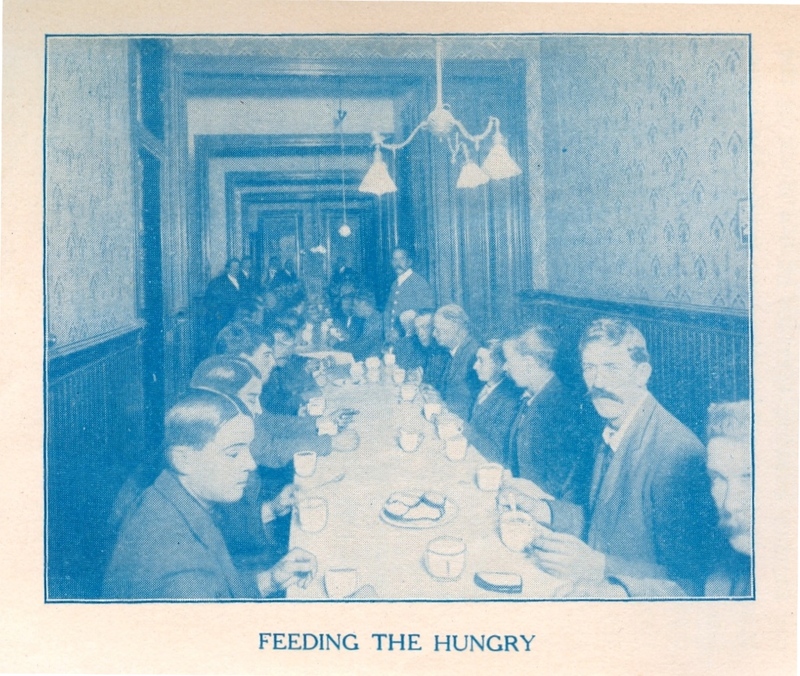 Though 145 was not large, the rented rooms there and its evangelical crew produce great work — in 1906 they held 1,800 services; gave food, clothing and shelter to 2,700; saw 3,201 men and women converted to Christ; and reunited 132 families. The next year Union Rescue buys the building outright. Testimonials from those turned from drink and crime blossom. 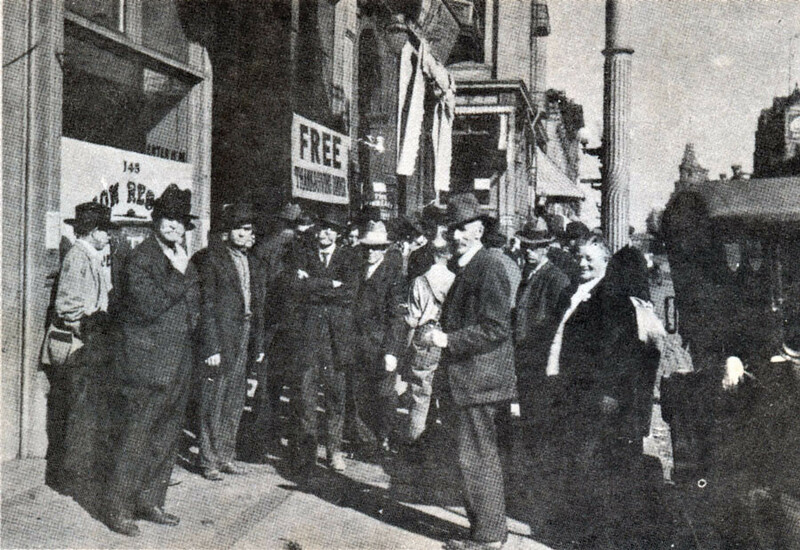 It is at this time, 1907, that indignant saloon keepers and liquor wholesalers took their protests to the City Council and had the Mission’s colorful public enterprises curtailed. 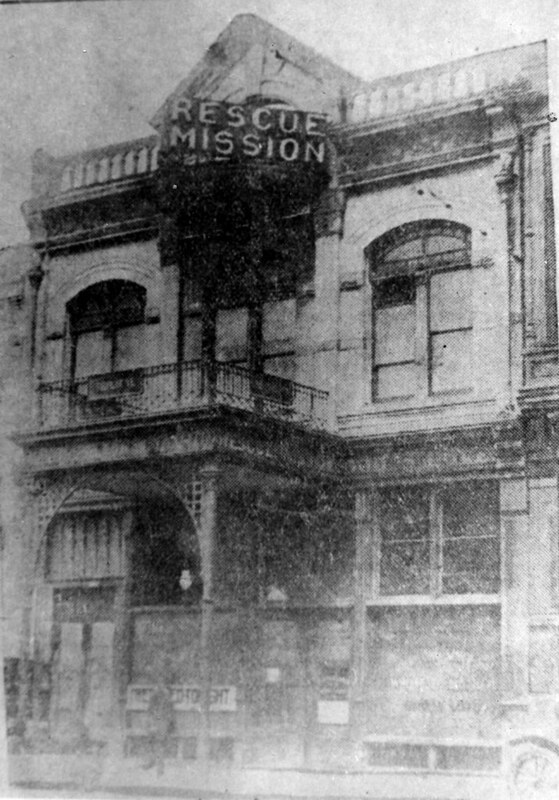 In 1908 the Mission on Main boasted “one of the cleanest, brightest mission halls to be found anywhere.” From its reading and class rooms, dining and lecture hall, poured a thousand-plus every year, who, lost and helpless, found salvation. At this time Stewart and Thomas Corwin Horton, Bible teacher at the Mission, begin a Bible institute, whose fundamentalist evangelical work stretch world-wide (but that is another story). 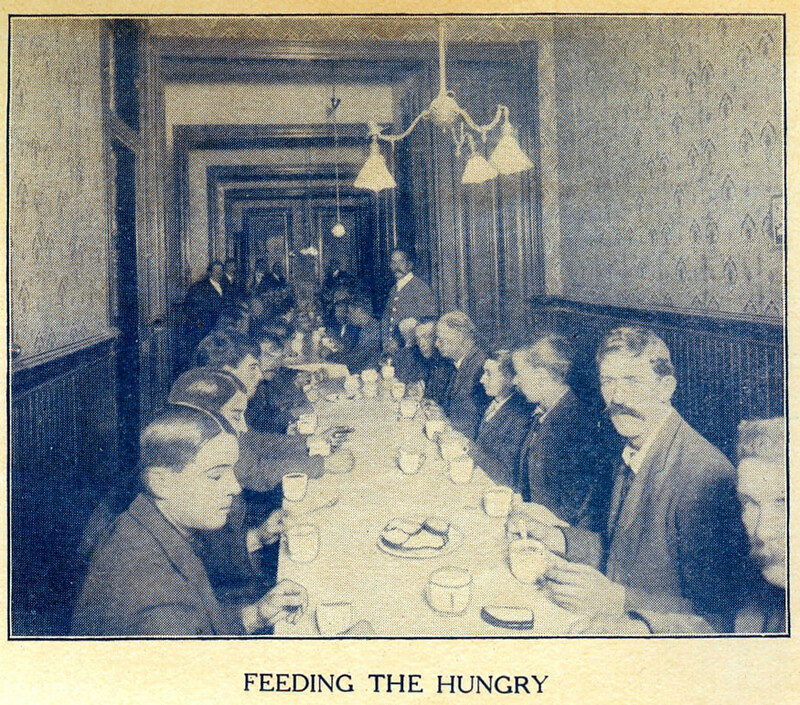 The ‘teens and ‘twenties continue without great incident (see men get their 1917 Thanksgiving turkeys here); there are moments of financial hardship, usually relieved at last minute by a healthy pledge. There was even some worry (as it could be called) that they’d done their job too well; they were preaching to good-size congregations of the saved (as was their newly-formed Church of the Open Door), and, in 1920, alcohol was made illegal — certainly THAT was going to quiet things? 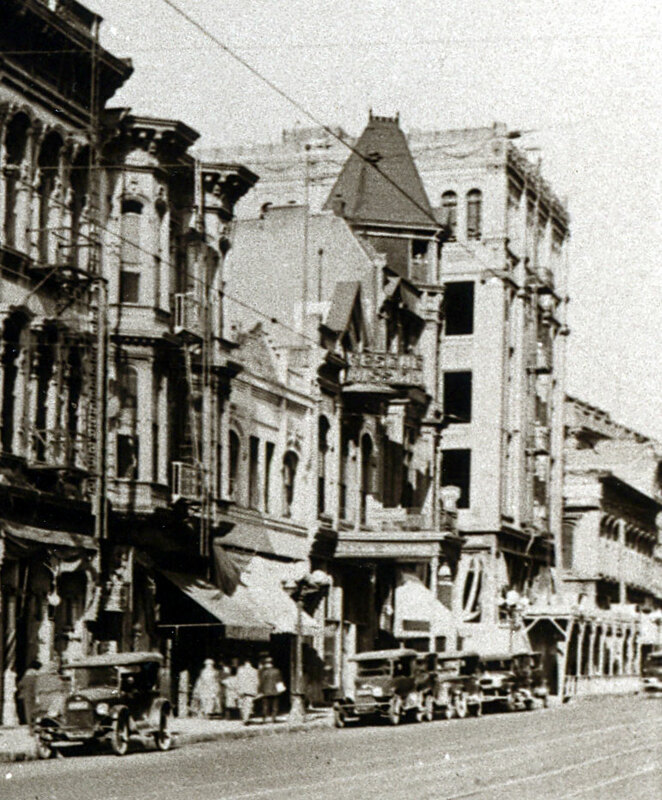 Of course, in short order, the Mission realized the need for a relocation: services in helping the needy were growing both in demand and taxed by their quarters at 145. Then, in June 1923, the citizens of Los Angeles authorized $7.5 million in bonds to raze a large parcel of land at Spring, Temple and Main for a City Hall. This sealed the fate of 145. Much of 1924 is spent arguing with the City over value (the URM estimated 48k, the City offered 37: the two parties settled on 43k in 1925). 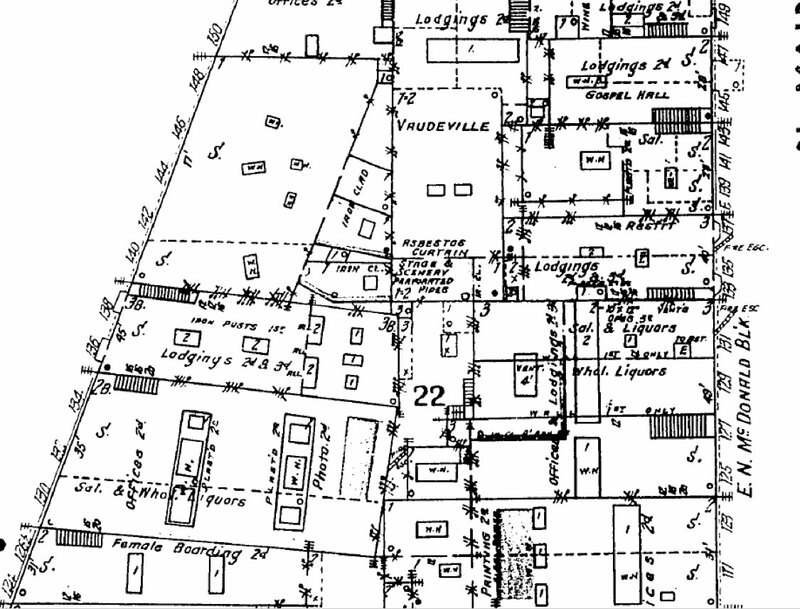 Thus what was once a rather vibrant block — this being a shot of some of it, from the 1906 Sanborn, showing our Mission at 145 (upper right) surrounded by vaudeville, and liquor wholesalers, and female boarding, that euphamism for one of those less savory occupations — well, just go and compare it to that same square of land from the 1950 map, post-City Hall. Not that we all don’t have a deserved fetish for our City Hall; but 145 was a charming little building, with its elliptical transoms, spindlework’d porch, with another balcony and railing across an open-pediment roofline (this was lost a bit with the addition of their larger sign) and its slender pilasters leant the whole affair a sense of lightness. 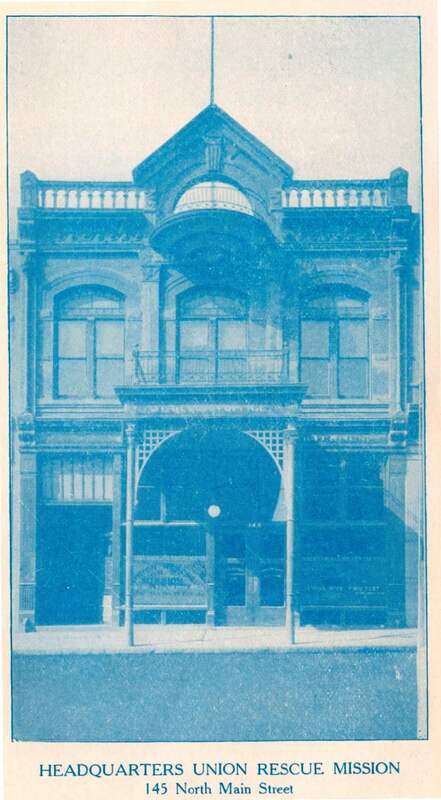 Not to mention the whole rest of the block — here we see it from 115 up to the hotel at 151, the large building across Court St. is the 1896 J. 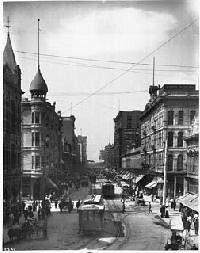 A. Bullard Block. Because there’s what looks to be demo fencing, nor does the Bullard appear to have any windows, I think it’s fair to assume this was during the early moments of her removal. Which means time is limited for everybody. Tongues were wagging on every floor of the Alexandria Hotel this morning, following the delicious faux pas of conservative businessman Walter Dinmore, a resident of San Francisco and Los Angeles. 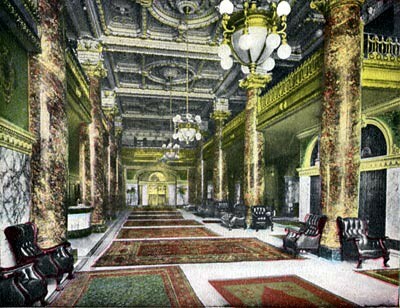 Roused by his “Jap” valet to take an important long distance telephone call from Santa Barbara in the lobby, the tousled Dinmore hurried from his room, only to encounter barely supressed merriment at every turn. First a crew of Catholic girls fresh from their worships chortled, then an elderly lady he waved into the elevator seemed about to perish from the giggles. A bell hop dropped a pitcher of water, so great was his glee upon seeing Mr. Dinmore. Finally, the gentleman was alone in the telephone booth, where he had a moment to reflect upon the curious afflictions of his fellow guests… and gaze down his own legs, to see vast billows of pink silk pajama material covering his shoes. Mortified, he dashed for the elevators, but found them engaged. In rising horror, he grabbed a porter and demanded aid. The porter led the humiliated Dinmore into a secret nook below stairs where he could divest himself of his shameful sartorial sin, then slink upward, his errand quite forgotten. Below, a place where pink pajamas are not welcome. 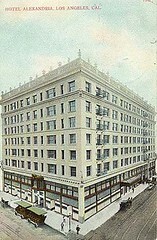 The old Menlo Hotel, corner of Winston and Main, was the way station for many a visiting Angeleno, and the last exit for a few. The Menlo offered moderate weekly and monthly rates to appeal to the varied respectable folk who flocked to the growing city. Most of them are long forgotten, but it’s hard to feel badly about this obscurity. When the names are known, too often there’s tragedy attached. Case in point, Mrs. Harriet Mortimer Palmer, aged 25. 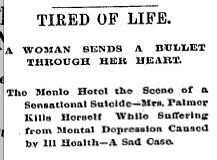 On the afternoon of April 10, 1890, she used a revolver to shoot herself through the heart in her room in the Menlo. Harriet and her husband, both invalids, had come from Toronto during the winter. They lived quietly in the hotel, he struggling with his heart disease and she with consumption. In March, her condition worsened, but when Dr. T.J. McCarthy was called, she refused his care, and demanded to move into an adjoining room away from her spouse. Once alone, Mr. Palmer spoke candidly with the doctor, complaining that his wife’s nervousness and irritability were a torment, as were her regular threats to do harm to herself. The worry was impacting his own health. On April 10, Mr. Palmer had a crisis, and the doctor came several times to attend to him. It was during one of these visits that a shot rang out in the next room, and when McCarthy rushed in, he found Mrs. Palmer dying, sprawled across the pillows she had heaped upon the bed to catch her as she fell. The bullet passed through her left breast, spine and shoulder, and was recovered about fifty feet down the hall. A note in her satchel read “I am thoroughly tired of life and so end it by my own hand. Please kindly send notice of my death to my aunt in Canada.” As for Mr. Palmer, he was reported to be in critical condition, and it was feared the shock of his wife’s death would kill him. But if it did, his passing did not make the papers. The maids came in and cleaned their rooms, and life at the Menlo went on. 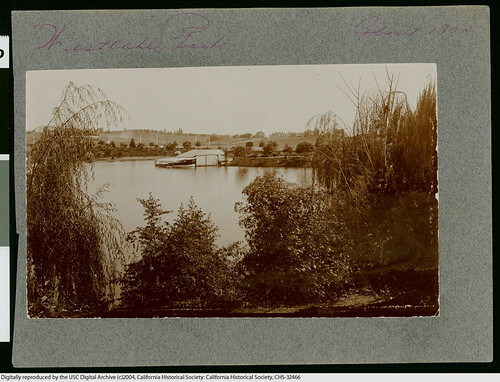 Late one evening in March 1896, a respectable looking young woman in a gown of black, woolen brocade and a matching cape lined with salmon silk made her way out to Westlake Park. She removed her cape and hat, placed them neatly on a bench, and drowned herself in the lake. In the morning, her things were spotted by gentlemen walking in the park, and after a brief search, her corpse was found floating near the shore. 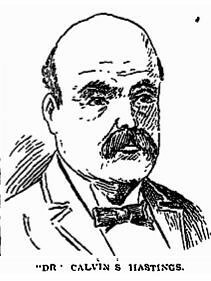 In her purse was found a pawn ticket from Mr. Morris’ shop, showing that she’d left a watch under the name Nellie Emerson. This was the name the Davises first knew her by, although over the five months of her employment they had accidentally found that she was really called Minnie Judy. Minnie was 24 with family in the Northwest, and had been out on her own since the age of 16. She was described as unfailingly good natured, so her departure and apparent suicide were a mystery. Two men came forward with stories of having seen the girl before her fatal plunge. Veterinarian R.T. Whittlesay, offices on Broadway near Seventh (just a block from the funeral home where she lay on display), remembered a sad face gazing into his window on Tuesday night and was certain it was she. 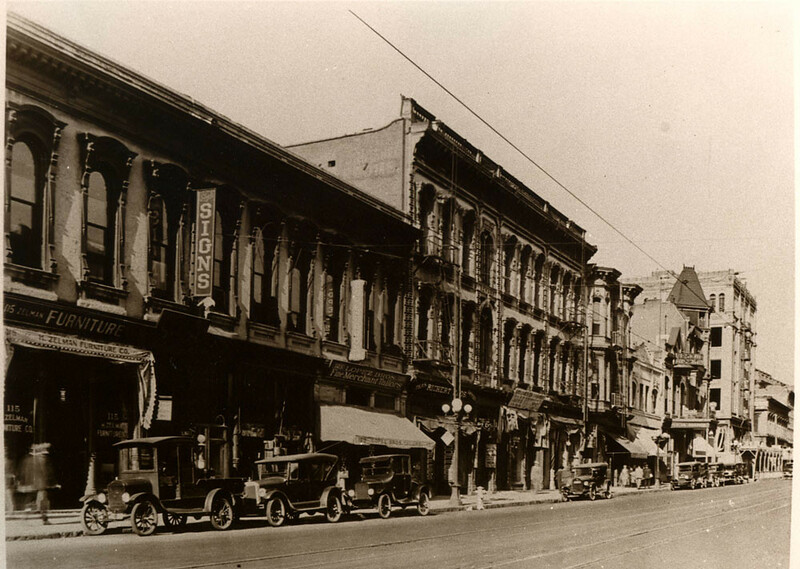 And an unnamed colored man who worked in a Winston Street corral and had known her for a year claimed he saw Minnie Judy the night of her death coming out of the old Los Angeles Theater with a dashingly dressed, dark-haired man. He said he heard the man suggest they catch a cab, as the last streetcar had passed. But officials had doubts about this tale, as the witness described the girl as wearing a large, feathered hat, not the small, modest one found on the bench in the park. 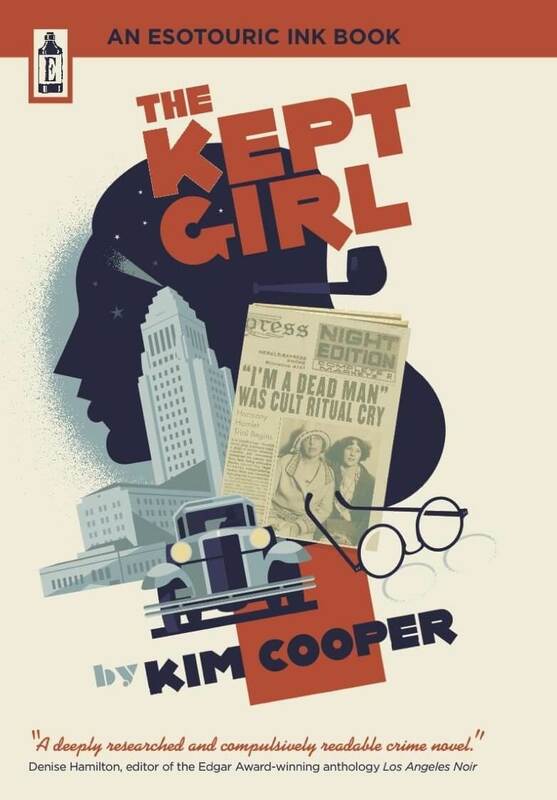 Why would a girl drown herself in 1890s Los Angeles? We have the usual suspicions. Had she been “ruined” by some cad, or did she have an inner sadness she didn’t show to other people? Was she really out at the theater with an unknown man the night she died? We’ll likely never know. But spare a moment to remember this poor lost girl of the city, and Messers Walters, Irving, Holt and Canserd whose morning constitutional was shattered by their discovery of the waterlogged lass, and the hundreds who took a few moments of their day to gaze upon a dead, drowned face for their amusement. And remember too the old Menlo Hotel, which was briefly home to thousands of anonymous souls, and to a very few whose names we know. “The girl was thirsty and wanted ice water constantly. She wouldn’t eat much, and vomited black stuff. 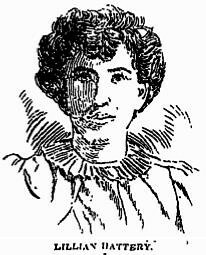 She was in a great deal of pain on her left side and her abdomen.” So ended the short life of Lillie Hattery, age 22, on February 5th, 1897, in the clinic of “Dr.” Calvin S. Hastings, Medical Electrician, according to testimony presented at his murder trial. 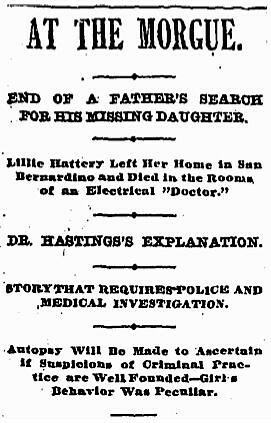 When Lillie Hattery came from San Bernardino to visit her sister in Los Angeles in late January, she arrived with the names of people rumored to perform “criminal operations.” “Dr.” Hastings, who practiced without the benefit of a medical license, was third on the list. According to testimony at the trial, Lillie paid $200 for Hastings’ services, which included multiple applications of electrical current to the back and abdomen, as well as a surgical procedure, which resulted in copious blood loss by the patient. Lillie suffered from fever, convulsions, and severe pain for a week, during which Hastings treated her solely with electrical stimulation. Two licensed medical doctors examined Lillie’s body after it had been delivered to the morgue, and determined that the cause of death was septicemia due to blood poisoning. They also determined that she had been pregnant and undergone an attempted abortion. At his trial, Hastings testified that Lillie Hattery suffered from an injured ankle, which he treated with electrical stimulation. He claimed that she appeared in good health until the very last moment before she succumbed to what he assumed must have been an internal abnormality such as a diseased heart or some other affliction. 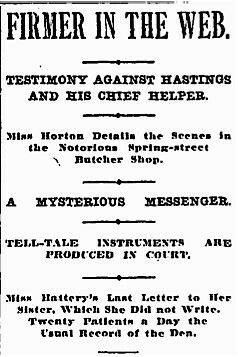 Although the prosecution presented evidence of perjury and intimidation of witnesses on the part of both Hastings and his nurse, along with surgical instruments found in Hastings’ offices that were commonly used for abortion procedures, as well as closed court testimony from a young woman who had recently undergone the criminal operation in Hastings’ care and had almost died, the jury still found Hastings innocent in the death of Lillie Hattery. 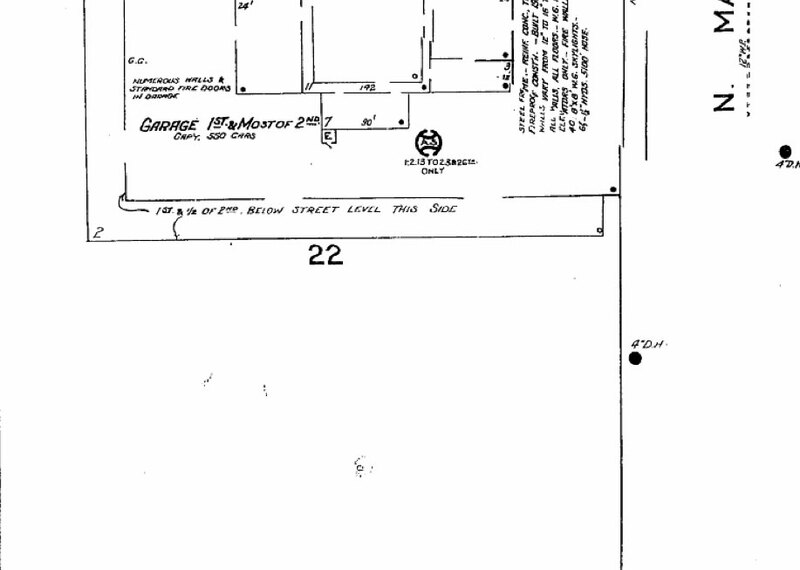 Hastings was even able to post bond during the trial, thanks to the generosity of a female admirer, and re-located his Medical Electrician clinic for business down the street in the Hammond Block at 120 1/2 South Spring. 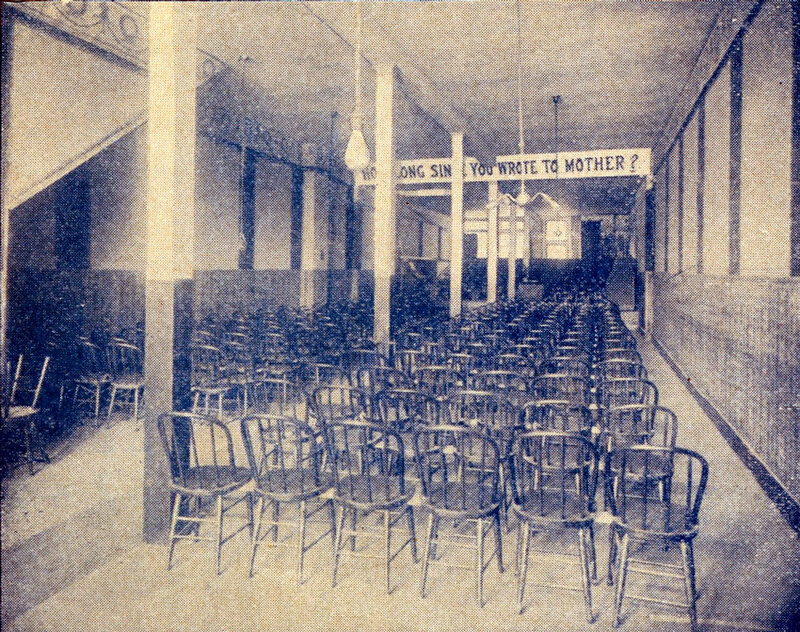 Hastings’ Medical Electrician Clinic’s Grand Opening so provoked a dentist in residence there that the man came to blows with the rental agent, and promptly moved out of the disgraced office building, where, he claimed, no decent woman would now darken a door. After his acquittal, Hastings married the woman who posted his bond. In later years she turns up as one of the many sufferers who find miraculous relief at the hands of the great healer, Rama, of the Rama Institute at 305 ½ South Spring Streets, Los Angeles. One can only wonder why Mrs. Hastings’ own husband was unable to heal her deafness with his electrical stimulation.